Some journalists and bloggers believe that Justice Scalia didn’t come up with that bad broccoli analogy on his own. They think he may be echoing GOP and conservative media talking points on the ACA. His fans keeping telling us of the brilliance of Justice Scalia — so brilliant, no one can touch him. But the broccoli hypothetical didn’t strike me as particularly brilliant. It sounded more Limbaughian than anything else, some conservative talking point on Obamacare circulated by the Republican Party. This wasn’t genuine judicial probing. This was cheap, sound-bite rhetoric that betrayed a predisposed hostility toward the law. Rush Limbaugh and Fox News have promoted the right-wing talking point that any reading of the Constitution that supports the Affordable Care Act’s individual mandate to purchase health insurance would also permit Congress to require all Americans to purchase broccoli. In doing so, they frighten their audience with the specter of limitless federal government power. This slippery slope argument turns out, however, to be too slippery by half, and it gets both the Constitution and the facts of the health care marketplace wrong. Limbaugh’s “broccoli mandate” talking point is refuted by economists who argue that the individual mandate is an appropriate response to the serious problem of consumers with preexisting conditions being unable to purchase insurance in the health care market. Furthermore, legal experts argue that the Constitution gives Congress the power to adopt the mandate, and this power does not extend to absurd hypotheticals such as a requirement to purchase broccoli. The 10th Amendment argument is a common line of attack by Republicans, including Mitt Romney, invoked to argue that ‘Obamacare’ tramples states rights. And though the states challenging the law claim the Medicaid expansion violates the 10th Amendment, Scalia cited it in reference to the individual mandate. It is plain now that Scalia simply doesn’t like the Affordable Care Act on its face. It has nothing to do with “originalism,” or the Commerce Clause, or anything else. He doesn’t think that the people who would benefit from the law deserve to have a law that benefits them. On Tuesday, he pursued the absurd “broccoli” analogy to the point where he sounded like a micro-rated evening-drive talk-show host from a dust-clotted station in southern Oklahoma. And today, apparently, he ran through every twist and turn in the act’s baroque political history in an attempt to discredit the law politically, rather than as a challenge to its constitutionality. (What in hell does the “Cornhusker Kickback” — yet another term of art that the Justice borrowed from the AM radio dial — have to do with the severability argument? Is Scalia seriously making the case that a banal political compromise within the negotiations from which bill eventually is produced can affect its ultimate constitutionality? Good luck ever getting anything passed if that’s the standard.) He’s really just a heckler at this point. If he can’t do any better than that, he’s right. Being on the court is a waste of his time. We’ll now have to wait until June to find out how the Supreme Court rules on the constitutionality of the Affordable care Act. I hope ideology doesn’t rule the day. Hi my family member! I wish to say that this article is awesome, nice written and include almost all important infos. What? Scalia sold out when massive profits for his friends were concerned? I am utterly not surprised. To observers of the ‘Obamacare’ oral arguments, it would come as no surprise that Justice Antonin Scalia is a likely vote to strike it down. But there has remained one major wrinkle in his prior jurisprudence that continues to give hope to a handful of the health care law’s proponents that he’ll vote to uphold it. Now, within days of the historic ruling, Scalia is releasing a new book in which he finds fault with a Roosevelt-era Supreme Court decision that forms a critical part of the legal undergirding for the health care reform law. For Scalia, that’s a dramatic turnaround, because he has previously embraced the premise of that decision in an opinion he authored in 2005 that supporters of the Affordable Care Act have frequently cited. In Scalia’s new book, a 500-page disquisition on statutory construction being published this week, he says the landmark 1942 ruling Wickard v. Filburn — which has served as the lynchpin of the federal government’s broad authority to regulate interstate economic activities under the Constitution’s Commerce Clause — was improperly decided. Scalia himself cited Wickard in his 2005 opinion in Gonzales v. Raich, concurring with a 6-3 majority that said Congress may, under the Commerce Clause, prohibit a licensed medical marijuana patient from growing pot in his or her backyard even if it’s legal in the state. A central foundation for that sweeping federal power, the winning side argued, flowed from Wickard. 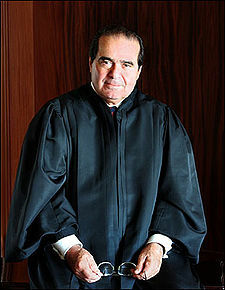 At the time, Scalia emphatically agreed, writing in his concurring opinion that “where Congress has authority to enact a regulation of interstate commerce, it possesses every power needed to make that regulation effective.” The Reagan-appointed justice’s decision upset libertarians who saw Raich as a squandered opportunity to limit the 70-year trend of reading the Commerce Clause expansively and giving the federal government broad authority when it comes to national economic regulation. The conservative justices, in their eagerness to reject all of this much needed reform, offer the deeply cynical justification that a new Congress will easily come up with a better plan — despite decades of congressional failure to address what is arguably the nation’s most pressing issue. In their passion to embarrass this president, the self-proclaimed constitutional purists on the court went so far as to equate a mandate to obtain health care coverage with an unconstitutional deprivation of freedom; to make the connection they cited the spirit of a document that once condoned slavery. The sad truth is that President Obama and the Democrats brought this potential judicial disaster upon themselves. In light of what has been said this week in the Supreme Court, it seems inevitable that the linchpin of the 2010 reform — mandated coverage — will be thrown out, probably along with the crucial accompanying reforms. Forget coverage for the young and those with pre-existing medical conditions. The Democrats will protect themselves from this reversal by arguing that all they did was copy the program that this year’s prospective Republican presidential candidate implemented when he was the governor of Massachusetts. Mitt Romney’s plan included the dreaded mandate that he and the Republican justices condemn. How ironic that Barack Obama’s health care agenda would be in a far stronger legal position had the president stuck by his earlier support of a public option. Clearly, our federal government has the judicially affirmed power under our Constitution to use public revenues to provide a needed public service, be it education, national security, retirement insurance or health care. Obama’s health care reform should have simply extended Medicare and Medicaid coverage to all who wanted and needed it — no individual mandate — while allowing others to opt out for private insurance coverage. That’s an obvious constitutional solution that even those die-hard Republican justices would have a difficult time overturning. Three days of oral argument over the Affordable Care Act at the Supreme Court made one thing clear: The Court doesn’t feel bound by existing doctrine and practices. If it did, as judges and scholars of many ideological hues have explained, the individual mandate’s constitutionality would hardly be a question. Instead, the Court may be ready to embark on a dramatic reconstruction of federal-state relations in favor of narrow reading of Congress’s power to regulate “inter-state commerce,” and, in particular, the use of that power to regulate that matters that are not “commerce” in the most banal and obvious sense. Concerns about the health-care law are often framed in terms of liberty from government regulation. At Tuesday’s oral argument, for example, Justice Kennedy expressed a concern that the mandate “changes the relationship of the Federal Government to the individual in a very fundamental way.” Presumably, then, striking down the mandate would preserve an individual’s insulation from federal control. Even if you accept Justice Kennedy’s concern—and we’ll get in a moment to why you might not want to do so—this argument doesn’t convince. In this case, the Court has been asked to contract the federal regulatory power to provide for a kind of social security; that is, against risks such as illness, poverty, and joblessness. But the very Justices who seem most eager to limit the government’s power in this domain have shown no inclination to check its national security powers—powers that pose more immediate risks of intrusions on individual liberty. The peculiar result of a decision invalidating the law would be a government barred from saving its citizens from catastrophic health crises, and yet perfectly able to track, surveil, and perhaps even detain them within only thin judicial review. Federal officials seeking to exercise regulatory power in the future would have a perverse incentive to garb their programs in the mantle of national security. Such a lopsided constitutional constraint would not produce more freedom. It would instead result in a different distribution of freedom the day after the Court’s decision. It would foster a federal government empowered to provide a kind of security most valued by the well-off (who, after all, can’t get afford their own armies—yet), yet unable to provide meaningful security for the most disadvantaged from the threats of illness, poverty, and exploitation. But it’s not clear that we should accept Justice Kennedy’s claim about the law’s effect on its face. That is, even if the short-term effect of invalidation would be to make federal social programs more difficult to enact, it may be that Congress’s power to regulate individual decisions in the same fashion as the individual mandate, without calling it that, may not be significantly diminished in the long term. Invalidating the mandate therefore would be less important for the durable limits it imposes on federal power, and more important for dealing a political blow inflicted on President Obama. If that is so, it is hard to see how invalidation can be defended as anything more than a partisan strike. Everyone now seems to agree that Congress’s power under the Commerce Clause of Article I of the Constitution to enact the mandate is the main issue raised by the case. It also appears that that the Court will not consider justifying the mandate on the basis of any other constitutional provision. Yet no one disputes that Congress could have imposed precisely the same mandate using its separate constitutional power to raise taxes, simply by clearly invoking that authority in the law’s text. Notice that the mortgage-interest tax deduction operates in precisely this way to much the same effect—changing private incentives through a tax penalty—and does so often with a larger fiscal impact than the mandate. Moreover, it is hard to see why Congress could not use its taxing and spending powers to enact and fund a single-payer system. The result might, from a libertarian perspective, be an even more intrusive federal intrusion into individual lives. Of course, if the mandate gets struck down, there is almost no chance that Congress will reenact it under these theories. But this has nothing to do with the Constitution, which endows Congress with the power to reenact the mandate using other powers. It has everything to do with the current political landscape. A decision invalidating the mandate thus may not recalibrate federalism—but it would promote the agenda of one political faction while harming another’s agenda. Compounding the partisan effect of the decision, Justices Kennedy and Scalia have suggested that if the Court finds the mandate unconstitutional, it should invalidate the whole Act. They claim that’s more “democratic” than picking and choosing through the law’s many provisions. Their argument that papers over the fact that Congress’s partisan make-up is simply not going to respond to invalidation by enacting any new legislation. Under these political circumstances, wholesale invalidation would distort, not enable, the expression of democratic preferences in a distinctly partisan way.